It feels wrong not to know basic survival skills our ancestors knew. We’ve let too many fade from our collective knowledge. I try to do my part by learning outdoor skills the pioneers used, so I was thrilled to receive an antique book, Camping and Woodcraft, as a gift. “Build a good fire on a level bit of ground. When it has burned to coals and the ground has thoroughly heated, rake away the embers, lightly drop the loaf (of bread dough, no pan) on the hot earth, pat it smooth, rake the embers back over the loaf (some hot ashes first), and let it bake until no dough will adhere to a sliver thrust to the center of the loaf. Dirty? No it isn’t; try it.” (The italics are mine for clarification). “Army Bread – This is easier to make than biscuit dough, since there is no grease to rub in, but it takes longer to bake. It keeps fresh longer than yeast bread, does not dry up in a week, nor mould, and is more wholesome than biscuit. It is the only baking powder bread I know of that is good to eat cold –– in fact, it is best that way. Before the trip, I mixed the dry ingredients in a zip-lock bag. 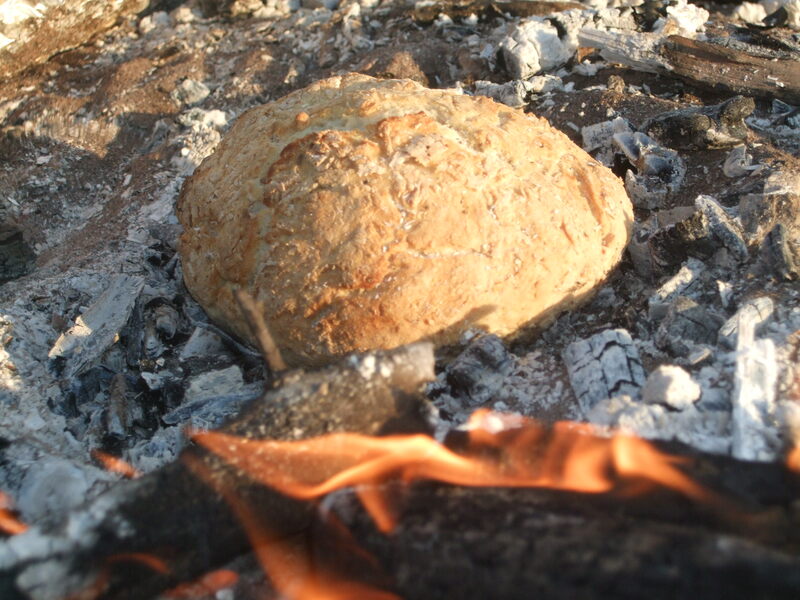 Fireside, I added the water and kneaded the dough in the bag and formed a ball from that. Baking takes about 40-45 minutes. Twice I’ve tried baking in ashes using this recipe. The first crusty loaf was excellent and tasted like pretzel bread. The bread came out of deep ashes left from a big campfire the night before. The second attempt on the canoe trip was less successful, but still good . . . a bit doughy on the inside. The difference was the depth of the hot ashes. On the canoe trip we had less firewood and less time to prepare dinner. I tried to increase the heat and hurry the baking by plopping an upside-down dutch over over the raw dough and adding coals on top of the pot. Fewer ashes resulted in a less-obvious pretzel taste. My fellow canoe paddlers were intrigued by the baking process and devoured the crusty bread. Give ash-baking a try after your next bonfire.